Russell Wilson was efficient, mobile when he needed to be, and on several drop backs enjoyed a nice pocket created by his offensive line. Running backs Chris Carson and Rashaad Penny both had nice runs, aided by solid blocking, and the offense also converted on fourth-and-1. And after 12 plays and 75 yards, the Seahawks offense found itself in the end zone at the end of its first possession in Thursday night’s preseason game. 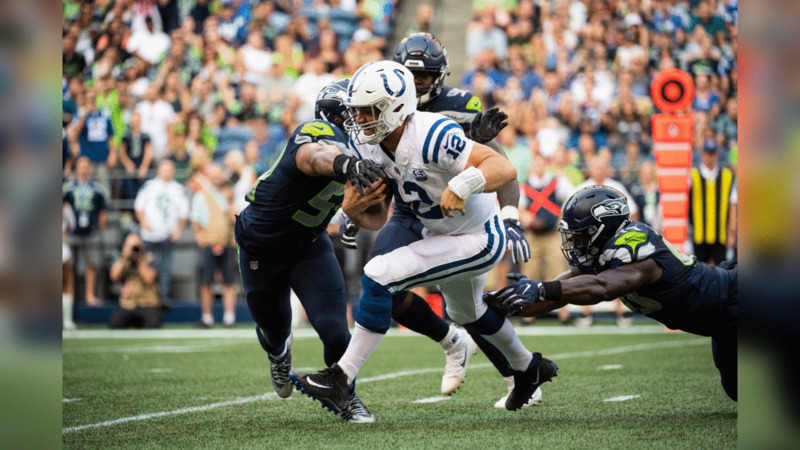 Wilson’s 5-yard touchdown pass to Nick Vannett won’t show up in the year-end stats, just as the 19-17 loss to the Colts won’t hurt Seattle in the regular-season standings, but preseason or not, that lone drive for the No. 1 offense was an encouraging start for a unit led by a new coordinator, Brian Schottenheimer, and offensive line coach, Mike Solari. “I was really happy with the fact that the offense went down the field,” Seahawks coach Pete Carroll said. “I thought they looked strong and right and on point. Russell moving well. Had a couple runs, nice throws and catches and all that. Everything worked out fine there. On a number of occasions dating back to the end of the 2017 season, Carroll has pointed to the running game as one of the most important areas of improvement for Seattle heading into this season, and while the overall rushing totals weren’t overly impressive—the Seahawks gained 87 rushing yards on 22 carries—that opening drive provided some glimpses of what the Seahawks want their offense to look like. As will always be the case with Wilson at quarterback, some rushing yards came on scrambles, with Wilson gaining 6 yards on the first play of the series, then later scampering for 8 yards as Seattle approached the red zone. But Carson also added runs of 4, 2, and 12 yards, the 2-yarder coming on fourth-and-one. The drive featured the kind of balance Carroll loves to see from an offense, with the Seahawks rushing for 37 yards on seven carries, and passing for 43 on five attempts. During offseason workouts, Schottenheimer noted that he wants an offense that is capable of running the ball even when an opponent knows a run is coming, and that 2-yard gain was a perfect example of that. For Wilson, who was historically great in fourth quarters last season, but who didn’t always get off to the fastest starts, an opening-drive touchdown is a good sign. But Wilson was most excited not about his own efficient performance, which saw him complete 4 of 5 attempts for 43 yards and a score, but by the play of an offensive line returning four starters from last season. In the end, it was just one drive in an August preseason game, one that won’t mean anything if the offense can’t back it up in the regular season. But preseason or not, that drive was something for the offense to build off of going forward. Game-action photos from the Seahawks preseason opener against the Indianapolis Colts at CenturyLink Field.